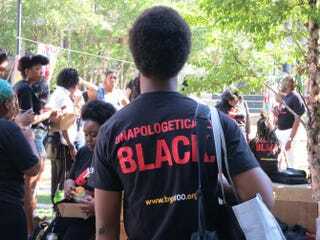 A young man stands, listening to organizers with Black Youth Project 100, on the campus of Cleveland State University during the Movement for Black Lives Convening on July 24, 2015. Black people and our allies have since taken to the streets by the thousands, and a massive online movement proclaimed that "Black lives matter." But two years later, the killings of Alton Sterling in Baton Rouge, La., and Philando Castile in Falcon Heights, Minn., a suburb of St. Paul, Minn., remind us of the continuing violence visited on black communities by our criminal-justice system. At a moment like this, we must reflect: Why haven’t we seen more progress? Why hasn’t our presence online and in the streets resulted in the power to end something as basic as state-sanctioned killings of black people? Our challenge has been one of leadership. We have marched, tweeted and made critical interventions in the presidential race and local politics, but our political leadership doesn’t have the courage to meet our demands. Those with the power to create structural change would rather crop around the margins of our current systems while doubling down on the same approaches that got us here. Our elected representatives continue to think that further investment in police departments that have historically criminalized black communities to feed mass incarceration is the solution for justice and safety in black communities. Elected representatives at the local, state and federal levels have invested millions more in more equipment, technology and officers for police departments. To fill this void in leadership and intervene in this current political moment, dozens of local and national organizations have come together for over a year to build our own platform to repair the harm caused by centuries of racial and economic oppression of black people. We know that no political party or candidate will save us, and it is time for us to articulate our ambitions and vision on our own terms. The result of that effort is the Movement for Black Lives platform. Our agenda is simple. We demand an end to the war against black people and reparations for the centuries of harm inflicted upon black people and our communities. Black communities have never been able to flourish without the impediments of slavery, segregation and mass incarceration. Separate and unequal schools, redlining, black codes, voter suppression, COINTELPRO, forced sterilization, subprime mortgages, the war on drugs, privatization of schools, prisons and detention centers. This list could go on forever. Black communities have been devastated by the same failed approaches to delivering on the empty promises of American equality and prosperity. Meanwhile, private prisons, big banks, police unions, the bail bonds industry and so many other defenders of the status quo are turning our pain into profit. At the March on Washington, Martin Luther King Jr. spoke about a "bad check" that America has given black people, and we are still waiting on payment on these American promises. Well, we believe the time has come for payment, and the M4BL platform is the bill. We demand investment in black communities and an economy based on collective ownership, not just access. The solutions for safety and justice for black communities do not lie in more spending on police or corporate takeovers of education. The answer is in investing in black communities. Black people have overcome the most cruel and persistent treatment at the hands of the U.S. government and corporate powers. In the face of exclusion, persecution and terror, black people have built vibrant communities and culture, only to have many of our gains dismantled to perpetuate the race, gender and class hierarchy in the United States. Our policy vision suggests the opposite approach. To make black communities safer, bring black children out of poverty and end the disparities in health, wealth and education, make real investments in black communities. Better yet, take the ridiculous spending on militarization and mass incarceration and use it for quality public schools, comprehensive care (e.g., health, mental, child and elder care) and economic programs. We demand political power and community control over the institutions that impact our communities. Black people in the United States have never had full access to self-determination. Our access to full citizenship, humanity and democratic rights has been under constant political attack. The power of the police and surveillance state has been used to undermine our movements for freedom. Still, we have led America through a painful and ongoing struggle to recognize the full humanity of every person. Our cultural and social movements have paved the way for and been woven together with the fights for immigrant justice, queer and trans liberation, workers’ rights and others. Now we must demand an end to efforts to deny black power through voter suppression, felon disenfranchisement and corporate takeovers of school districts and public access to clean water. Instead, we demand aggressive measures to increase black political power, including expanded voting rights and community control of law enforcement. We know that not all of our collective needs can be addressed through policy. But we know that our destinies are tied together, and we seek to strengthen our bonds through our struggle for collective justice, strength and power. We invite you all to join us in endorsing the Vision for Black Lives here. Janaé Bonsu is the national public policy chair of BYP100. She is a black feminist activist, organizer and scholar based in Chicago.